The saucer magnolia (magnolia x soulangiana) is a low-branching tree to large shrub that grows 20- to 30-feet tall and wide. Saucer magnolias have wide-spreading branches and deciduous medium-green leaves. The saucer magnolia blooms early, in March and April, before the leaves emerge, causing many of the blooms to die in spring frosts and freezes. The flowers are large, 5- to 10-inches wide, and white with pink and purple tinges. The saucer magnolia grows best in USDA hardiness zones 5 through 8, withstanding winter lows down to -15 degrees F.
Water your saucer magnolia deeply to soak the soil around the entire root area once or twice per week during the first spring, summer and autumn after planting it. In subsequent growing seasons, water the saucer magnolia tree once per week in the absence of rainfall. Feed your saucer magnolia once each year in early spring with a slow-release fertilizer made for acid-loving plants, trees and shrubs. Follow the dosage instructions on the label. Prune to shape the saucer magnolia tree when it’s young, because older magnolias don’t heal pruning wounds as well. Prune the saucer magnolia’s most aggressively-growing branches back after the flowers finish blooming. Remove any low-hanging branches if the magnolia is growing near a high-traffic area. Protect your young saucer magnolia tree’s flowers and buds from spring frosts by covering the tree with a blanket. When freezes or frosts threaten, drape the blanket over the tree in the evening and remove the blanket in the morning. Watch out for magnolia scale insects infesting your saucer magnolia tree’s twigs and leaves. Treat the infestation with an appropriate insecticide and spray the magnolia with horticultural oil in early spring to kill over-wintering scale insects. Plant your saucer magnolia tree in full to partial sunlight and in rich, moist but well-draining, slightly acidic soil. 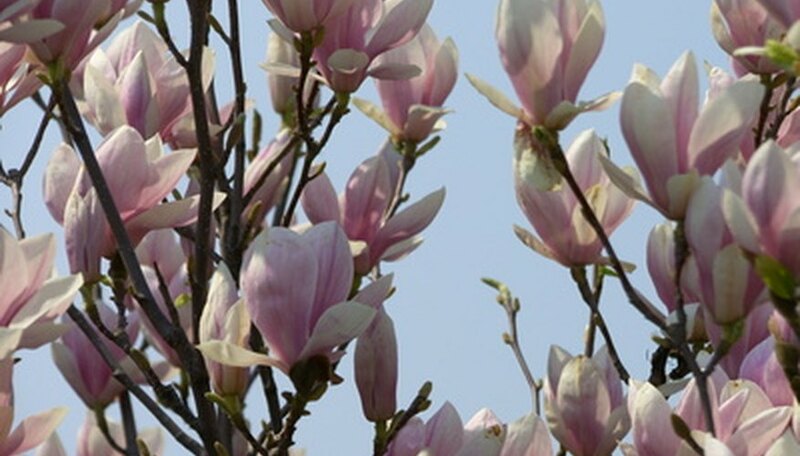 If you live in an area that often experiences late frosts in spring, avoid planting the magnolia in a southern-exposure location to prevent early blooming that can be killed by frosts. Beware of leaf spot diseases infecting your saucer magnolia tree, which are caused by various bacteria or fungi. Prune away all infected leaves, rake up all fallen leaves and destroy or discard the diseased leaves.